Pierce (1948) published one of the first comprehensive attempts, known to me, to record and analyse insect songs in a systematic manner. None of the equipment which we now take for granted, with the exception of the microphones, was then available to him. He manufactured a number of ingenious devices for recording and analysing calls, but his results are now of little more than historical interest. All of the insects that Pierce described produced loud, airborne, acoustic signals and were amenable to recording with standard microphones. The airborne calls of many insects extend well into the ultrasonic range. These may be conveniently detected and recorded by the use of a "bat detector", as reported for cicadas by Popov et al. (1997). Eliopoulos (Chapter 2) gives a full discussion on the diversity of microphone types and their characteristics, as well as the diversity of recording devices from tape recorders to direct recording with a computer. The realisation that many insects produce calls not easily detected by the unaided human ear, transmitted as substrate vibration, is relatively more recent. The detection of such usually low frequency signals requires some specialised, though not always expensive, equipment. The simplest method is the use of a crystal gramophone-type pick-up as a transducer in contact with the surface through which the insects are communicating (Ichikawa, 1976; Claridge, 1985a, 1985b). Other devices, including commercial accelerometers and the so-called magneto-dynamic system of Striibing and Rollenhagen (1988), have their adherents and are reviewed by Gogala (Chapter 21). All of these techniques share the same disadvantage of necessarily imparting some physical load on the substrate and may therefore affect the structure of any signals detected. The best solution is to use laser vibrometry, as first brilliantly applied to insect acoustics by Michelsen (see Michelsen and Larsen, 1978). Until recently this equipment has been prohibitively expensive and very difficult to take into the field. However, new developments are making the techniques more easily available (see Virant-Doberlet, Chapter 5; Gogala, Chapter 21; Cocroft and McNett, Chapter 23; and others in this book). Insect vibratory sense organs, including tympanal receptors specialised for detecting airborne sounds, have been much more widely studied and are reviewed here by Rossler et al. (Chapter 3), Cokl et al. (Chapter 4) and Virant-Doberlet et al. (Chapter 5). The word hearing is, of course, yet another with anthropomorphic overtones, but is used widely at least for the reception of airborne signals by insects. 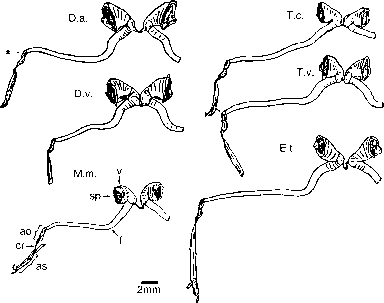 Moore, 1958, 1962) and planthoppers (Claridge, 1985a, 1985b; Claridge and de Vrijer, 1994). The complex functions of calls and the often wide song repertoire of insects have also been extensively studied (for example Bailey, 1991 and Chapter 8; Cocroft and McNett, Chapter 23). The nature of sound production and reception in any particular insect is clearly subject to a wide variety of physical constraints, one of which is body size. Small insects will inevitably be forced to use relatively high frequency sound, and even ultrasound, for aerial communication over distances of more than about one body length (Bennet-Clark, 1971). However, small insects may use low frequency sounds, providing that these are transmitted through the substrate. Little attention has been given previously to any relationship between body size and signal parameters for substrate-transmitting acoustic insects, but here Cocroft and De Luca (Chapter 6) present novel analyses on this. Among other physical constraints, temperature is a very obvious one. Rates of biological processes, including muscle vibration, must ultimately be temperature dependent and the effects of temperature on insect rates of calling have been frequently documented. Sanborn (Chapter 7) here gives an elegant review of effects of temperature on the calling of a variety of aerial insect singers.